A record 7,231 fans across the country made the pledge. Each had a chance to win one of two grand prizes, a trip for two to the 2015 NCAA Men’s Final Four or a trip for two to the 2015 NCAA Women’s Final Four, provided courtesy of the NCAA. The Men’s Final Four prize winner was Robert Ciucci. 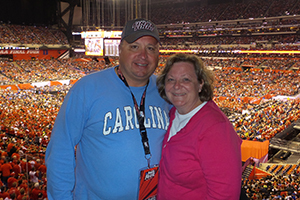 He traveled from Mechanicsville, VA to Indianapolis and received two tickets to the 2015 NCAA Men’s Final Four games on Saturday April 4 and received two tickets to the championship game on Monday, April 6 at Lucas Oil Stadium. The Women’s Final Four prize winner was Kendra Dowen. 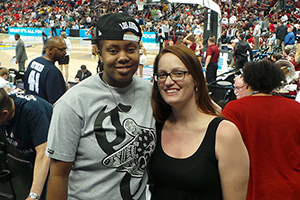 She traveled from Tallahassee, FL to Tampa and received two tickets to the 2015 NCAA Women’s Final Four games on Sunday, April 5 and received two tickets to the championship game on Tuesday, April 7 at Amalie Arena. 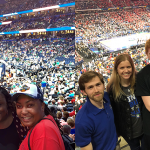 TEAM Coalition was also an on-site partner with the NCAA for the Men’s Final Four in Indianapolis, IN as well as the Women’s Final Four in Tampa, FL. 2,763 fans made the pledge to be responsible at the three-day, outdoor March Madness Music Festival at White River State Park and the four-day indoor Fan Fest presented by Capital One at the Indiana Convention Center. 1,324 fans made the same pledge to never drive drunk and always have a designated driver at the Tourney Town™ presented by Capital One in Amalie Arena. 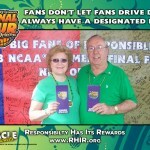 Every fan who made the pledge received souvenir photo after autographing the responsibility wall displaying the school colors and mascots of the Final Four competitors. TEAM Coalition will send the winning schools – Duke University for the men and the University of Connecticut for the women –the responsibility walls to celebrate their impressive victories and demonstrate an overwhelming NCAA fan commitment to responsibility. TEAM Coalition executive director, Jill Pepper, said, “TEAMUp2Win! reaches fans beyond the basketball arena, reminding them to celebrate NCAA® March Madness® responsibly.” Mary Wilfert, associate Director of NCAA Sport Science Institute said, “As a member of TEAM Coalition, the NCAA is very excited to partner with the TEAMUp2Win! 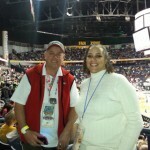 promotion, and to encourage fans of NCAA March Madness to make their responsibility pledges so that all basketball fans can safely enjoy the games!” Visit TEAMUp2Win.orgfor more information. Participants must be 21 years of age or older. The NCAA is a membership-led nonprofit association of colleges and universities committed to supporting academic and athletics opportunities for more than 400,000 student-athletes at more than 1,000 member colleges and universities. Each year, more than 54,000 student-athletes compete in NCAA championships in Divisions I, II and III sports. Visit www.NCAA.org and www.NCAA.com for more details about the Association, its goals and members and corporate partnerships that help support programs for student-athletes. Importantly, the NCAA opposes all sports wagering. This application should not be used for sweepstakes, contests, office pools or other gambling activities. TEAM Coalition is an alliance of professional and collegiate sports, entertainment facilities, concessionaires, stadium service providers, the beer industry, distillers, broadcasters, governmental traffic safety experts, and others working together to promote responsible drinking and positive fan behavior at sports and entertainment facilities. TEAM’s members and supporters include the National Collegiate Athletic Association, Major League Baseball, Major League Soccer, NASCAR, the National Basketball Association, the National Football League, the National Hockey League, ARAMARK, Delaware North Companies Sportservice, Ovations Food Services, Beer Institute, National Beer Wholesalers Association, Anheuser-Busch, MillerCoors, Brown-Forman, Live Nation, National Association of Broadcasters, Contemporary Services Corporation, Elite, International Association of Venue Managers, Stadium Managers Association and the National Highway Traffic Safety Administration. CATEGORY: NCAA , Press Release , TEAM Coalition News , TEAMUp2WIN!